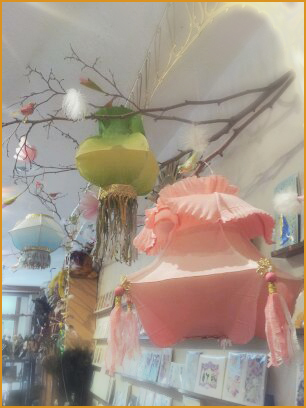 John McRae surprised us today with these sublime pastel lanterns. He made them using our crepe paper, florist wire, cotton batting balls, tacky glue and dresden trim. What inspired him? The material. He claims that there is nothing that can compare to our crepe paper. "It makes you feel like you can make anything. You can do anything!" He certainly brightened our work day! He transformed the Castle into a garden party by the simple act of hanging his festive lanterns. So true! Your crepe paper are the most gorgeous!